Fall restraint—Preventing a person from falling over the edge. In this post, we’ll detail the steps to properly hoist, set up and safely attach to the Garlock Life-Link Cart. While this information was taken from Garlock’s operating manual, Hy-Tech Products recommends that every contractor working with the Life-Link Cart read through the manufacturer’s instructions carefully before using. Before hoisting the Life-Link Cart to a roof deck, make sure that the roof can support the cart’s weight (1,000 lbs.) in addition to all material, equipment and personnel. Weak roof decks under this type of stress can collapse. To hoist the Life-Link, use an OSHA-approved 4-point sling with a minimum-rated capacity of 2,000 lbs. Hook all four sling connection points onto the four cart lift lugs (1 connection point to 1 lug lift) (see right). 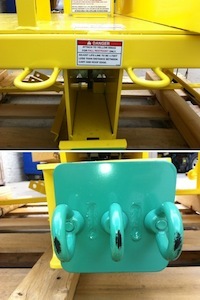 When attached, the sling’s chains should be long enough not to press against the cart. If they are too short, you will need to purchase longer changes as the stress put on the chains by the cart’s weight may cause damage to the cart or cause the sling to fail. On the roof deck, remove all debris, loose roof coverings, and any ice, snow, water, oils, dirt or dust from where the cart will be positioned, as these may prevent the cart from locking in place. 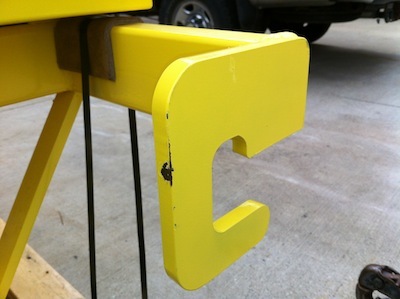 Next, perform a pre-use inspection using the Inspection Label on the side of the toolbox. Make sure there is nothing obstructing the pull plate (square green plate that the green attachment rings are secured to) from extending forward, and that the claw can swing down directly into the roof deck should someone fall. Align the cart so its side runs parallel to the roof edge and is a minimum 15 feet (no less) away. Position it straight back from the work area (see right). 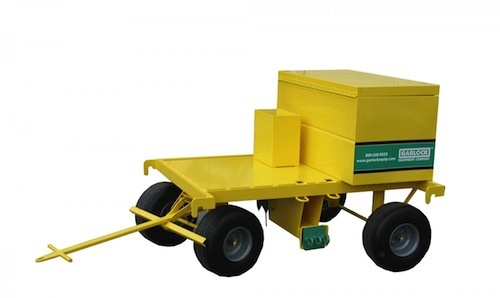 Make sure the cart handle points straight forward, and the angle brake (perpendicular bar located near the end of the handle) engages the tires to keep them from rolling. When attaching contractors to the Life-Link Cart, use only self-locking snap hooks and carabineers that are specifically designed for fall-protection devices. The Life-Link Cart includes two types of attachment rings. When attaching snap hooks and carabineers to either rings, make sure all closures are fully closed and locked in place. 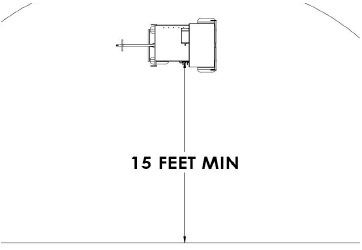 While attached to the Life-Link Cart, make sure the angles of lifelines to the cart are no more than 45°. 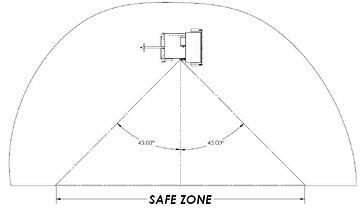 Venturing past this “safe zone” could cause serious injury or death should the worker fall. If you have any questions, or would like clarification on any of the items addressed in this post, please contact Hy-Tech Products 216-661-5000 or email info@hy-techroof.com. WARNING: Serious injury may result if this product is misused. The manufacturer’s operating manual provides instructions for use and care of the Life-Link Cart. It is important that all operators read this manual completely to ensure their safety and the ongoing performance of the cart.